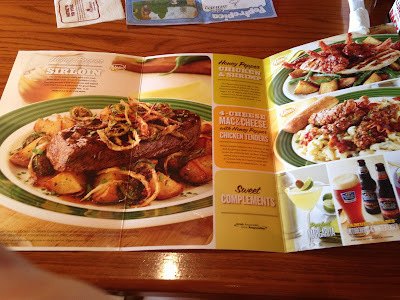 I was so excited to get the opportunity to try out Applebee's new items from the Honey Pepper menu. The same day we got our e-gift card, we headed out to dinner as a family. The idea behind this is that total opposites attract, which they totally do. My husband and I are total opposites for MANY reasons, but yet we're one in the same at the same time, that's what makes a perfect couple right? My daughter is also my opposite in how stubborn she is. So I decided to bring them with me to enjoy this meal. At first, one might think, honey and pepper together. But trust me, it is AMAZING. The perfect blend of sweet and spice combined in a yummy dish. I got the Honey Pepper Sirloin. It is a 7oz sirloin with peppers and onions on top and has some red potatoes on the side. I upgraded to the 9oz sirloin for $2 extra. The flavors truly marry each other perfectly and it makes such a yummy combination and meal. Also on the menu is the Honey Pepper Chicken and Shrimp. The Sirloin and Chicken and Shrimp can also be found on their 2/$20 menu as well, so a cheaper way to eat. My only complaint is the Sirloin just wasn't enough. Online and in the menu it's on a whole bed of potatoes, but mine only came with about 1/2 a potato cut up. It just wasn't enough to fill me. Hubby said his was enough and it looks like it came with a good amount of food as well. Overall though the experience was awesome and the food was so good. I'd definitely order again. Price: The sirloin was $11.79 here in MI (and then $2 extra for the 9oz) and the mac N cheese was $11.49. The Chicken and Shrimp is $11.89. Definitely the mac n cheese!! I had the chicken and shrimp and it was delicious! honey pepper chicken tenders, my husband. Honey Pepper chicken and shrimp looks real yummy!! My opposite is my Hubby! This is a hard decision. I'd like to try the 4-cheese Mac and Cheese with honey pepper chicken or the Chicken and shrimp. The Honey Pepper chicken Tenders look yummy. I'd bring my best friend, who is my opposite. I'd love to try the Honey Pepper Chicken & Shrimp. I would like to try the Four Cheese Macaroni and Cheese and Honey Pepper Chicken Tenders. I don't know who my opposite is. My husband is very similar to me. My middle son might be closest to opposite myself: easygoing, affectionate, sweet, and kind; but I wouldn't label him my "opposite" either. I'd get the sirloin: http://applebees.com/menu/entrees/steaks/honey-pepper-sirloin and opposite me would be my husband. I would get the honey pepper chicken tenders with a house salad. My husband would get the steak! I will get the Sirloin with a salad if I win. My opposite is my sister. I would like to try the Honey Pepper Chicken and Shrimp. It looks divine! Mmmmm.... Shrimp! i would love to bring my very opposite hubby to try the honey pepper sirloin! I want the Honey Pepper Chicken Tenders and my opposite is my husband. I'd love to try the 4-Cheese Mac & Cheese with Honey Pepper Chicken Tenders! And my husband is definitely my opposite. We are SO different ~ ugh! I would get the Honey Pepper Chicken and Shrimp with my opposite my husband. I would get the 4-Cheese Mac & Cheese with Honey Pepper Chicken Tenders. My sweetie pie is my opposite! HONEY PEPPER SIRLOIN sounds delicious! My husband is my opposite! Thanks for the giveaway. Honey Pepper Chicken and Shrimp for me and my husband! That honey pepper chicken and shrimp is perfect for me. I could also go for the sirloin, but minus the green peppers b/c I'm allergic to them. My opposite? Tough one but I'd have to go with my other best friend Jennie. I would get the honey pepper sirloin. YUM! I think the Honey Pepper Sirloin looks good! I would like to try their Honey Pepper Chicken & Shrimp. Honey Pepper Sirloin would be my choice! My opposite is my husband. I would get Honey Pepper checken tenders. My hubby is my opposite! Favorite is Honey Pepper Chicken & Shrimp. Opposite would be my sis. honey pepper chicken and shrimp sounds yummy. my sister is my opposite. The Honey Pepper Sirloin! My opposite is my dd! She is such a girly girl - total opposite of me! Honey Pepper Chicken and Shrimp for sure! It looks so yummy! Oh they all look soooooo good...I'd go with the Sirloin. My favorite family restaurant. I would pick the Honey Pepper Chicken & Shrimp. I might get Honey Pepper Sirloin. My opposite is my partner Scott. I'd get the 4-Cheese Mac & Cheese with Honey Pepper Chicken Tenders. My opposite is my husband. But that's okay because we complement each other. Thanks. The mac and cheese looks like something I would enjoy. It looked great on the menu on the website but in the picture you posted it looked like something I would/could throw together at home. I'm just wondering if the presentation of the mac and cheese was a little disappointing to you? the honey pepper chicken tenders. The opposite person(s) in my life is my mother and my sister. honey chicken and shrimp. My opposite is my boyfriend. HONEY PEPPER CHICKEN & SHRIMP for me! the 4 cheese mac and cheese with the chicken tenders looks yummy. My opposite is my hubby! HONEY PEPPER SIRLOIN looks yummy and my opposite is my hubby! I'd get the Honey Pepper Sirloin. My opposite is my husband. I would try the Honey Pepper Chicken & Shrimp sounds great! I've tried the 4-Cheese Mac & Cheese with Honey Pepper Chicken Tenders and it is amazing! I would try the Honey Pepper Chicken & Shrimp. It looks really yummy. I like the Honey Pepper Chicken and Shrimp. My husband is my opposite. Honey pepper sirloin looks great. I love steak and I am always opening to trying a new flavor. The honey pepper chicken and shrimp! My opposite is def my husband! I would like to try the Honey Pepper Sirloin. I would like to try the Honey Pepper Chicken and Shrimp. I'd like to take my husband. I would get the HONEY PEPPER CHICKEN & SHRIMP. My opposite is my stepsister Vanessa. The Honey pepper chicken and shrimp sounds delicious. Definately my choice. The chicken and shrimp sounds delicious!! I would try the honey pepper chicken and shrimp.My mom is my opposite,She has bad taste. I would try the Honey Pepper chicken and shrimp. the mac and cheese looks so yummy! I would like to have the mac and cheese. The opposite would be my grandson. I'd try the honey peppered sirloin. I would get the "4–Cheese Macaroni and Cheese with Honey Pepper Chicken Tenders" but ask for regular chicken tenders with it, because I don't like sweet and savory mixed together; and I don't like honey. Honey pepper chicken and shrimp. Yummy! The honey pepper chicken and shrimp looks delicious! That would be my choice! I want to try the Honey Pepper Chicken Tenders + House Salad. Thanks for the chance to win! 4-cheese Mac N Cheese with Honey Pepper Chicken. I would get the four cheese Mac N Cheese with Honey Pepper Chicken Tenders ...my opposite would be the steak.. I'd like to try the Honey Pepper Chicken Tenders. My hubby and I are sooo opposite. I would get the HONEY PEPPER SIRLOIN & hubs is my opposite. like the honey pepper chicken and shrimp. My mom is my opposite. I'd go for the chicken and shrimp! When it comes to food my husband is definitely my opposite, I would choose honey and he would choose pepper, my shrimp, him chicken, I could go on and on lOl! I'd get the Honey Pepper Chicken Tenders. My fiancé is my opposite because he likes red meat, I like chicken. I'd choose Chicken and Shrimp. My daughter is my opposite. She's her daddy times two! I would get the 4–Cheese Mac & Cheese with Honey Pepper Chicken Tenders. My opposite is my daughter. Honey Pepper Chicken Tenders sound delicious yum! My husband <3 We love Applebees and we get the 2 for $20. We are a cheap date customer. I would try the Honey Pepper Chicken Tenders! My opposite is my hubby! my husband and I would both enjoy the 4 cheese mac and cheese. I would like to try the Honey Pepper Chicken & Shrimp! I would get the three cheese mac and cheese! 4-Cheese Mac & Cheese with Honey Pepper Chicken Tenders! Thanks so much for the fantastic giveaway! The 4-Cheese Mac & Cheese with Honey Pepper Chicken Tenders. I would get the Honey Pepper Sirloin. My opposite is my middle daughter. **The Honey Pepper Sirloin! This is my hubby and I's favorite restaurant. When I was pregnant with twins we went here all the time, this is all I craved!! I would LOVE to win this and take my opposite, my hubby!! Thank you so much!! The Honey Pepper Chicken and Shrimp sounds so yummy! I'd get the honey pepper sirloin, yum that looks awesome! My opposite would be my husband. I would bring my hubbie along to try the honey pepper chicken and shrimp. I am entering under the name Jennette. I would try the honey pepper chicken tenders! I would get the Honey Pepper Sirloin and my daughter would be my opposite. I'd get the 4-Cheese Mac & Cheese with Honey Pepper Chicken Tenders . And my husband is my total opposite! The honey pepper chicken and shrimp sounds awesome. My opposite is my exboyfriend. I'd like to try the HONEY PEPPER CHICKEN & SHRIMP! Most definitely the mac n cheese. My bestie would be my opposite. I'd try the crispers w/ salad. Something light with a little bit of kick. I miss Applebees. theHoney Pepper Chicken & Shrimp! I would get the new †Honey Pepper Sirloin and my brother is my opposite. I would love the Honey Pepper Chicken and Shrimp dish. My sister is my opposite. It seems impossible we came from the same parents. I would like to try the honey pepper chicken tenders. my husband is definitely my opposite! The honey pepper Chicken and Shrimp looks good! I would definitely try the 4-Cheese Mac and Cheese! I would get the honey pepper chicken and shrimp, and bring my husband who is my opposite. honey pepper sirloin would be my choice. 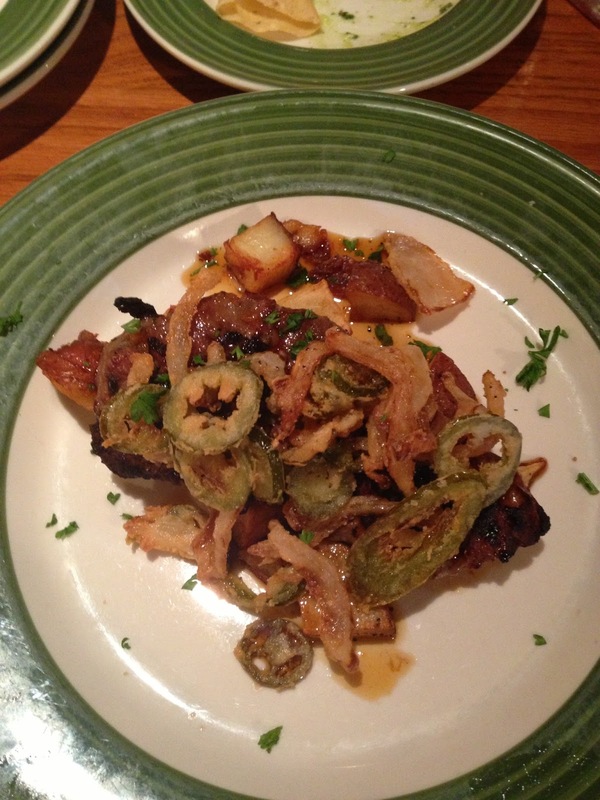 I love steak and its pretty much all I get from Applebee's!